Self-styled anti-terrorism expert and British Obsession pundit Glen Jenvey has just released an extraordinary statement, in which he appears in effect to repudiate the “anti-Jihadi” efforts by which he came to public attention. It is published on Cryptome, and has also been sent to me from his email address. I phoned Anjem Choudhary yesterday and he wants me to meet him. I won’t go into the details of what we discussed. Anjem Choudary is the most notorious Islamic extremist in the UK who’s not behind bars, so this is astonishing. The background to all this is quite long and complicated, but to cut a long story short, back in January ago the Sun published a front-page splash which claimed that extremist Muslims were using a web forum to plan attacks on British Jews in revenge for Israeli action in Gaza. In particular, the businessman Alan Sugar was named as a target. 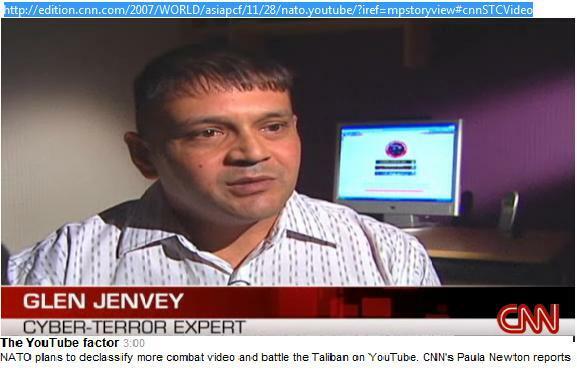 The source for the story was Glen Jenvey, but Tim Ireland of Bloggerheads found evidence suggestive that Jenvey had made the extremist postings himself under a false Islamic identity. The Sun removed the story (without any public explanation), and articles about the controversy appeared in Private Eye and the Guardian. Jenvey has strongly protested his innocence, and he claims that the Guardian article was written to protect a Guardian columnist. Another link between the men is Glen Jenvey, accused by several newspapers of fabricating stories about Islamic extremism. Jenvey has eight ‘friends’ on his Facebook site; two of them are Ray and Smeeton. The 6-page statement lists a number of video tapes to be used in the extradition case of Abu Hamza and one video links James Ujaama to Abu Hamza. Without these tapes, which kick-started the case in America, it will be hard to present a valid case against Abu Hamza now that I’m withdrawing all evidence due to personal attacks and lies by the Daily Mail…I ask thugs at the Daily Mail to leave my friends and family alone. It made me feel sick the Daily Mail‘s claims that I was a Nazi. By “bloggers from the far left and supporters of the failing Labour Government”, Jenvey means in particular Tim Ireland. In fact, I haven’t read anything anywhere that either attacks or even mentions members of Jenvey’s family (As a side note, the idea that Tim works on behalf of the Labour Party has been taken from an allegation made against him in comments that have appeared on conservative blogs; Tim has denied it). I believe that Sheikh Abu Hamza and Sheikh Abu Qatada should in good faith both be allowed out of prison on a control order as soon as possible.